Shortly after her return to England from Surinam in 1664 Aphra Johnson married one Johan Behn a merchant of German or Dutch extraction. Stanley Kunitz and Howard Haycraft. 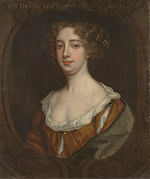 Aphra Behn (baptised 14 December 1640 – 16 April 1689) was a prolific dramatist of the English Restoration the first English professional female writer. Along with Delarivier Manley and Eliza Haywood Aphra Behn is sometimes referred to as part of "The fair triumvirate of wit. ".